This worksheet is worksheet on lines . Q-1 Identify which of the following pairs of angles are complementary and which are supplementary. Q-3 Two supplementary angle differ by 460. Find the angles. Q-4 Two complementary angles are in the ratio 7: 8. Find the angles . (2x +5). Find the value of x.
Q-6 Identify each pair of angle. Q-7 Find the value of x and y in following figure. Q-8 In the following figure l || m, n || P and ∠1 = 850. Q-9 The difference in the measures of two complementary angles is 120. Find the measures of the angles. Q.10 Consider the diagram in Q.8. If ∠1 = 2x + 60 and ∠3 = x + 110 then find x and also find the measure of angle 1 and angle 2. Q.11 Define parallel lines and transversal. Q.12 Find the angle, which is equal to its supplementary. Q.13 The sum of two adjacent angles is 140. If one angle is thrice that of the other. Find the two angles. Q.14 Two supplementary angles are in the ratio of 5:7.Find the angles. ∠5 = x. Find x and measure of each angles. Q.16 State True or False. 1) Two obtuse angles form a linear pair. 2) Two acute angles form a linear pair. 3) If two adjacent angles are complementary they form a right angle. 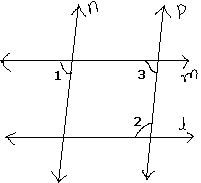 4) An Angle is formed by the intersection of lines or line segments or rays.